One of the best options on today's Internet to listen to a song, any song for that matter, is to search for that song on Youtube. Chance is there is at least one video with that song on the video portal. Some web users use Youtube more or less exclusively to listen to music. 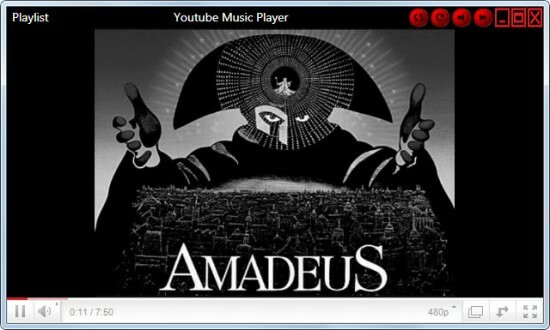 The Firefox add-on Youtube Music Player tries to make this more comfortable to those users by offering them comfortable features such as playlists and an external player. The extension supports multiple playlists which can be played, created and edited directly in the browser. Several controls are added to the browser which some users may not like. 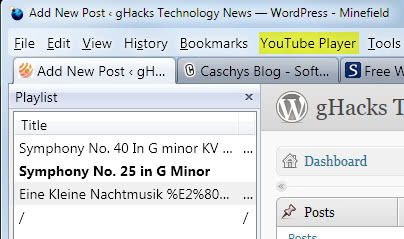 The biggest concern is probably the Youtube Player entry in the Firefox menu which unfortunately cannot be disabled. Bad for users who need that screen estate for other elements of the browser. Playlists are filled with music in two ways. It is possible to use the built-in search with preview to add single videos to the playlist or visit Youtube and add videos with a right-click and the selection of Add to Youtube Player in the context menu. The player itself is launched in its own window independently from the browser window. It is minimalistic which means it does not take up much space (none if minimized). The standard controls are available including pausing the video, changing the resolution or running it full screen. Playlists can be saved and loaded which means that they are available in future sessions as well if saved properly. The extension offers several options like randomizing the playlist, repeating it indefinitely or Last.fm scrobbling which requires the username and password. The idea is interesting and there are certainly users who will appreciate the extension. The biggest concern for many are the elements that are added to the browser which cannot be removed. We have already mentioned the extra menu item, the extension in addition adds music player controls and information to the Firefox status bar of which the majority is removed if no music is played. Users who want to try the Youtube Music Player Firefox extension can install it directly from the Mozilla Firefox add-on repository. Very cool; does this still use Flash to play the videos or is something smarter, more stable, less resource-intensive used?